Three potential alternatives for road access and transmission lines have been identified for Susitna-Watana Hydro. The environmental study plan area includes all three potential routes. A high-level feasibility study was conducted by the Alaska Department of Transportation and Public Facilities (ADOT&PF) and public comments were solicited to aid in the decision making process. A favored route decision is not anticipated until the license application is filed with the Federal Energy Regulatory Commission (FERC). When at all possible, the transmission lines will be co-located with the road access. A second transmission line is likely to provide redundancy and security for the Railbelt’s Intertie. The two east-west road access corridor options are planned to terminate at the Alaska Railroad; the north-south route connects with the Denali Highway. Chulitna Corridor: Runs north of the Susitna River and extends to the Chulitna siding area. Gold Creek Corridor: Runs south of the Susitna River and extends to the Gold Creek area. Denali Corridor: Runs due north for a distance of about 44 miles, connecting with the Denali Highway roughly 20 miles to the community of Cantwell. The affected sections of the Denali Highway would be upgraded in order to facilitate safe construction and transportation safety improvements in Cantwell would be made. The transmission lines will begin at the dam site and consist of three 230-kV lines, in either single or double-circuit configuration. 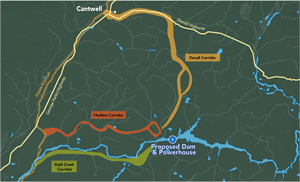 The same three corridors under consideration for the access road are also those under consideration to connect Susitna-Watana Hydro transmission lines to the Alaska Intertie. 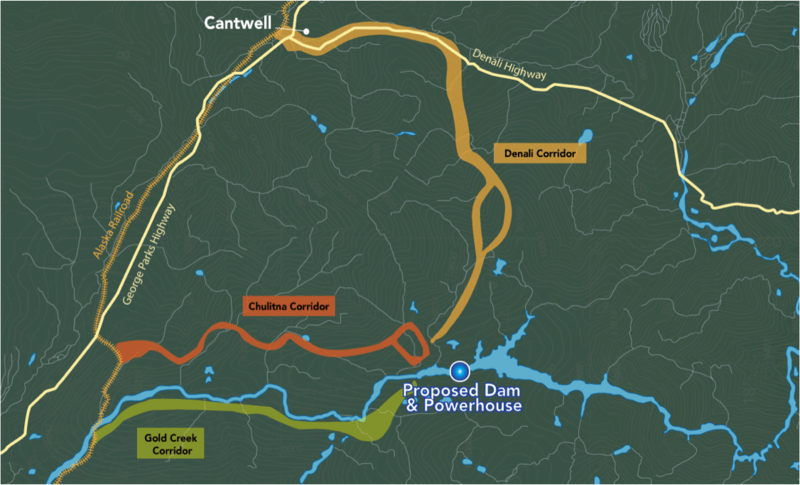 Access to the transmission line corridors will be either by helicopter where there is no access road projected, or by unpaved vehicle access from the permanent access roads at intermittent points along the corridor. Alaska’s Railbelt electrical grid serves 75 percent of Alaska’s population and accounts for more than 85 percent of the state’s electricity. The AEA owns the 170-mile Willow to Healy portion of the transmission line between Anchorage and Fairbanks.